​After a tree has been removed, you may want to get rid of the stump. If you do, you will need an affordable tree service company in Evansville that performs tree stump grinding and removal services. Great news: Evansville Tree Service is that tree care business! You could, certainly, leave the tree stump cut low and cover with mulch, rocks, or groundcover. Or, if you are creative, you could turn the stump into a yard chair, an ornamental piece, or a planter. Or you could have a chainsaw artist create some type of carving. However, these alternatives are not very practical and will likely either cost more money and/or still leave you with a tree stump in your landscape. In the end, the best and most practical solution is to either remove it or have it ground up. In both cases, the appearance of the stump will be eliminated and you can plant grass or sod right over top of it. Call the knowledgeable tree care specialists at Evansville Tree Services today for your tree stump grinding or removal needs. Either choice will quickly and effectively remove the stump from your landscape. Will likely require backfill soil to fill in the hole where the tree stump was removed. The grinding process creates a lot of wood chips that can either be removed and recycled or as mulch in your landscape. More expensive than stump grinding. The price of stump grinding and removal is based on the size of the tree stump, and then to a lesser degree its location, type of tree, and age. Stump grinding will always be cheaper than removal due strictly to equipment cost. Our tree care professionals can advise you on what option is best for you particular situation. We can either provide the free estimate at the time we perform your tree removal or, if we didn't remove the tree, then we would be happy to come to your property to provide the estimate. All of our stump removals and grinding projects are covered by our umbrella insurance policy and we are licensed as well. 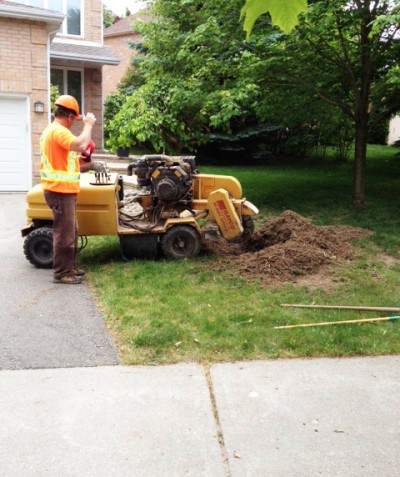 Stump grinding and removal should always be done by a professional, and utility line markings should be done prior to any digging or grinding. We can coordinate with the Evansville utility companies to ensure no power or water lines will be disturbed during the process. Once again, we are the tree services Evansville trusts to do quality, affordable, and professional tree care work. ​Either as part of your tree removal job or as a separate estimate, we can quote your stump removal or grinding work with a free estimate. And, we offer multiple stump discounts should you have more than one stump to eliminate.